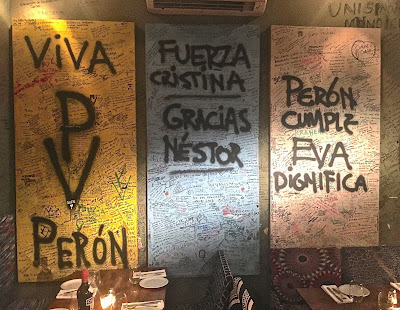 Southern Cone Travel: ¿Peronismo Vegetariano? Some time ago, I wrote a post that touched on the topic of so-called Peronist cuisine, which almost seems an oxymoron—the working-class followers of Argentina’s legendary strongman Juan Domingo Perón were not exactly known for their culinary sophistication. Still, there’s a stereotypical roster of basic dishes that appeal to the so-called descamisados (shirtless ones) who comprise(d) the Peronist base (perhaps as Kentucky coal miners might appreciate Donald Trump’s overcooked steak with ketchup). 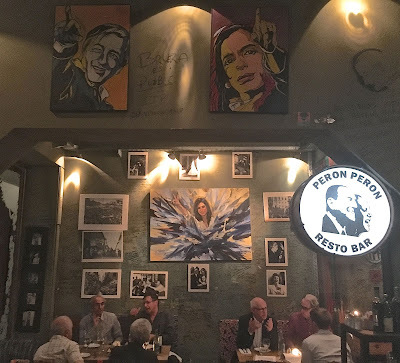 Last week, I decided to try the fare at Palermo Hollywood’s Perón Perón, in an area that’s not home to many descamisados, and is walking distance from our own Palermo apartment. One might argue that it’s an Argentine analogue to Tom Wolfe’s “radical chic,” with middle-class diners indulging themselves with somewhat more sophisticated versions of working-class comfort food. 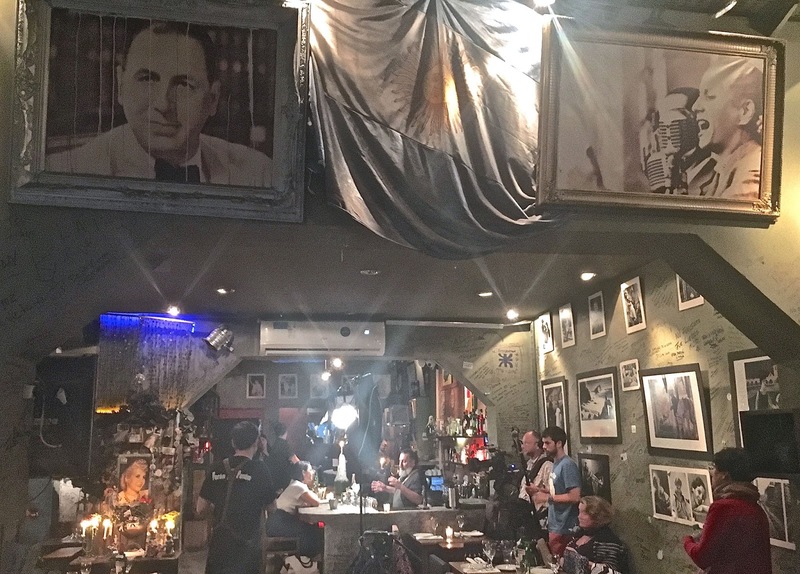 When I arrived around 7:30 pm, relatively early by Argentine standards, a BBC film crew was interviewing chef Gonzalo Alderete Pagés, who spoke more than passable English. The BBC speaks to the chef. I was pleasantly surprised with the food. 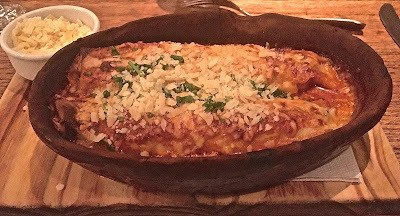 The menu does feature a lot of heavy comfort food such as guiso de mondongo (tripe stew) and various incarnations of milanesa (chicken-fried steak), but I chose to go vegetarian with canelones de acelga (chard cannelloni; I really like chard, and my late mother-in-law made terrific chard pie even though she wasn’t much of a cook otherwise). I was pleased with my chard cannelloni. 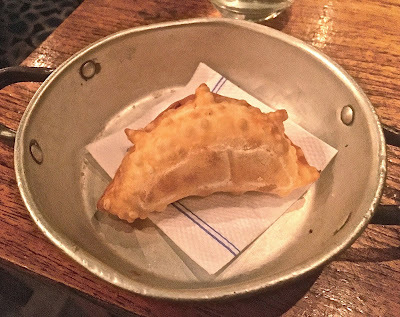 Never before had I seen an asparagus empanada. The oddest item was an asparagus empanada, which aroused my curiosity as I’d never heard of such a thing before; it was fried but not too heavy, though I would have preferred a bit more asparagus in it. My glass of Domingo Hermanos Malbec came chilled, which is how my late father-in-law took red wine (as do many other Argentines). The wine list focuses on vintages from the Andean Northwest. For dessert, I had a satisfying rich dark chocolate mousse. 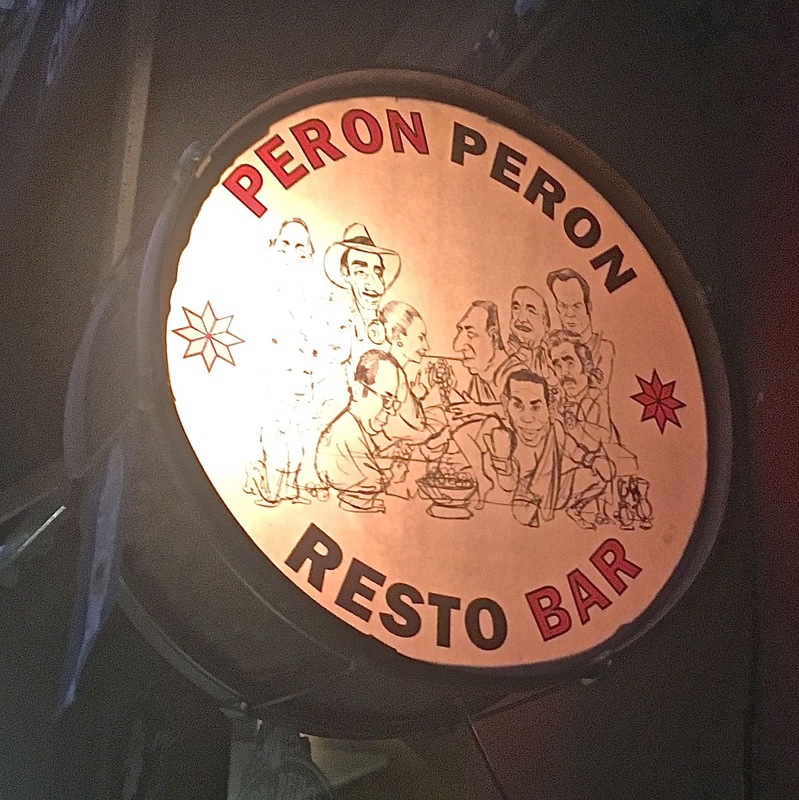 The dining area is full of Peronist iconography. I should add that the service was surprising good, which is not something you anticipate from a movement that prides itself on labor militancy (spoiler: they were all wearing shirts). 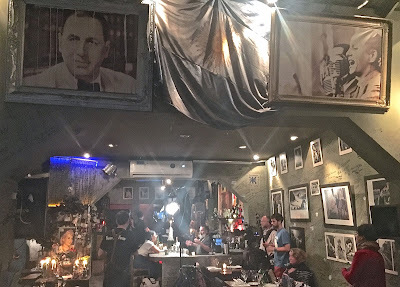 The décor, of course is a shrine to Perón and Evita (and their would-be successors Néstor Kirchner and Cristina Fernández de Kirchner), and thus more than a bit kitschy. I’d happily go back, but I think I might prefer winter when I could order something like locro, a northern Andean stew whose warm heaviness would be welcome in cooler weather (though this spring has been mild in town). Peronist sloganeering is part of the décor.